The Sandman Chronicles: Thessaloniki International Book Fair is opening tomorrow! Thessaloniki International Book Fair is opening tomorrow! 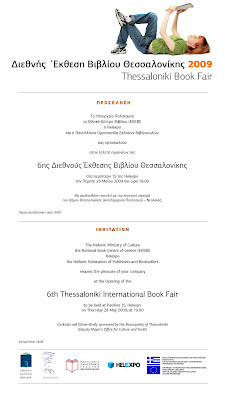 A grand celebration... an established meeting place... a unique experience... every May… in Thessaloniki... the 6th Thessaloniki International Book Fair. Thessaloniki Book Fair (TBF) takes place from the 28th until the 31st of May at HELEXPO Exhibition Centre (Halls 13 and 15). It offers visitors an opportunity to get acquainted with the latest releases of publishers from all over the world. * Take your time to roam around the publishers’ stands. * Choose from a varied programme of cultural events. * Join in discussions with writers from Greece and abroad, and ask them to sign their books for you. 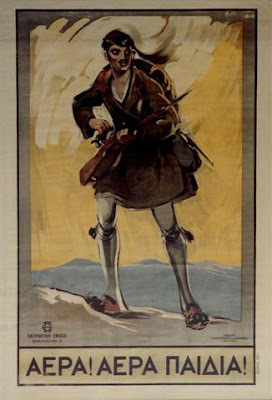 Poster from the Balkan War era. 5. A Literary Cafe (Hall 13), a meeting point and a place of relaxation for both visitors and professionals, where they can enjoy a free cup of coffee (kindly sponsored by Domingo). 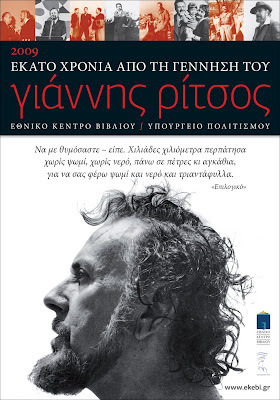 Also, the Hellenic Ministry of Culture has dedicated the year 2009 to the poet Giannis Ritsos (“Giannis Ritsos 2009 – 100 years since his birth”). 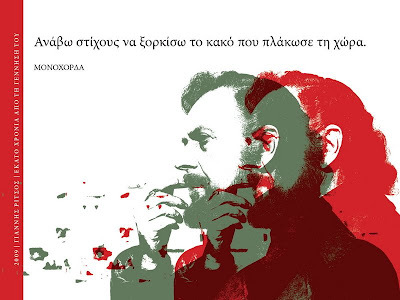 EKEBI has therefore planned a special ode to Giannis Ritsos, featuring the mobile exhibition on the poet’s life and work, spotlighting both the originals and translations of his work. On Saturday 30 May (20:00), a concert will be held in the main square of the Fair, with a great festive atmosphere and songs by Mikis Theodorakis, Thanos Mikroutsikos, Christos Leontis and Panagiotis Bousalis. 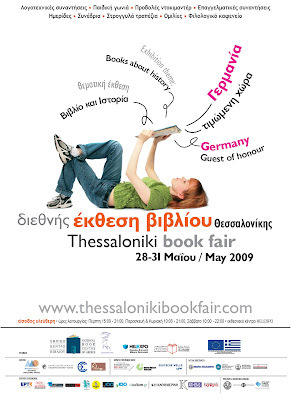 The Fair is organized by the National Book Centre of Greece (ΕΚΕΒΙ), in co-operation with the Greek Ministry of Culture, HELEXPO and the Pan-Hellenic Federation of Publishers and Booksellers (PΟΕΒ). The Fair is a project co-financed by the European Union (ERDF) and the Hellenic Ministry of Culture (EU Culture Program). Check the program here! (Greek only I'm afraid). EKEBI has a blog too, so check that out as well! As every year since it began, the company I work for, Tetragon, has designed and built all the stand that are related to EKEBI: their own, the thematic exhibition stand (Books and History), the Children's Corner and the Literary Cafe. Photographs and more on the next days! See you there! Δεν πάω να τσεκάρω το πρόγραμμα, δε μπορώ να έρθω ΣΕ λέω! Και μ αρέσει το καινούριο στυλ!! !